Artist Director Sharon Poelstra invites the audience to join Blyth Festival Singers in singing The Maple Leaf Forever. 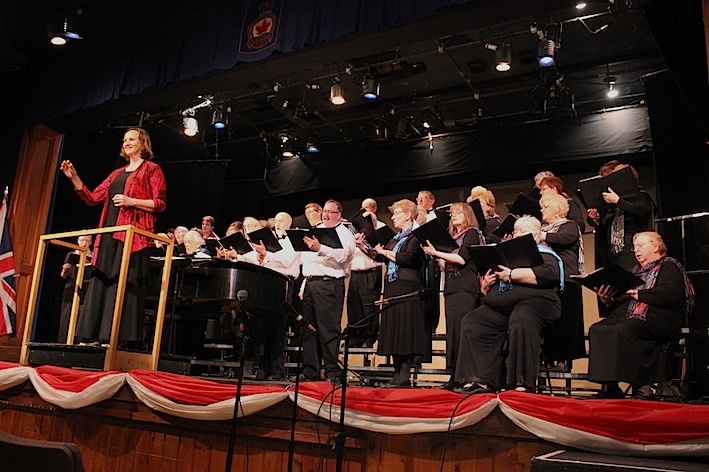 BLYTH – The advertising poster promised a tribute to the 70th anniversary of the end of World War II by the Blyth Festival Singers, with special guests The Howlin’ Dog Vintage Jazz Band. But that poster couldn’t possibly capture just how fantastic the carefully crafted two-hour performance of Songs of Wartime and Peace at the Blyth Memorial Hall would be. It wasn’t just a playbill of popular songs like Sentimental Journey, The Maple Leaf Forever and Boogie Woogie Bugle Boy, or uncovered gems like In Flanders Fields and Distant Land. Instead, it strung together music, solos, sing-alongs, readings and commentary that invited the audience into one big parlour party. Cara Stephenson performs Don’t Get Around Much Anymore. talented collection of 38 voices accompanied by Lori Millian. At the same time, the arrangements highlighted numerous singers, through no less than five solos, a fun and energetic dance performance of Don’t Get Around Much Anymore by Cara Stephenson, and a poignant reading from his memoirs by Tom Hennessey. The audience was invited to join in singing The Maple Leaf Forever and It’s A Long Way to Tipperary, and a few voices floated up from the audience during other popular tunes. The Howlin’ Dog Vintage Jazz Band. The Park House, subscribed to one of the great jazz cornerstones – improvisation – by winging much of its sets. 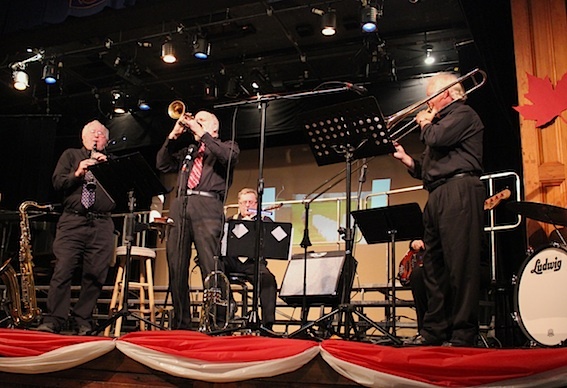 The musicians held their first practice with the day’s replacement trombone player Paul Dearlove just hours before they were set to take the stage. They strayed from the program, dropping some songs and picking up others. They debated who would lead them into a song, with trumpet player Al Mullin telling the audience, “This is jazz. We gotta figure it out as we go.” And in the end, it all came together beautifully. Blyth Festival Artistic Director Gil Garrett reads from Mary’s Wedding, which premieres in the 2015 season at The Blyth Festival. performance of Mary’s Wedding. He read from a letter written to Mary from her love, Charlie, a young soldier who describes the battle scene at France’s Moreuil Wood, jumping his mare over his fallen sergeant and feeling his saber pierce through another man’s body. He also did a reading from Mary’s wedding day, when she weds someone else. The readings gave time for the choir to quietly file in after the jazz band’s sets. 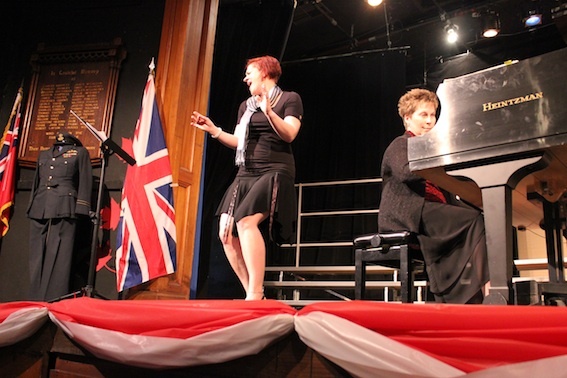 How fitting too that the event should take place in the Blyth Memorial Community Hall, which is home to the Blyth Festival, the Blyth Festival Singers, the Blyth Festival Orchestra and the Blyth Festival Art Gallery. The hall was originally built to commemorate the lost soldiers of World War I. When: Saturday, May 30 at 6:30 p.m.
What: Blyth Festival Singers’ cabaret dinner and concert featuring young up-and-coming soloists from Huron and Perth, which will be the next generation of musicians to perform alongside Blyth Festival Singers. Music at this concert will be more light-hearted and popular in style and theme, to bring its season to a close in true celebratory fashion. How: Tickets, $25, available at the Blyth Festival Box Office or from Choir Members. 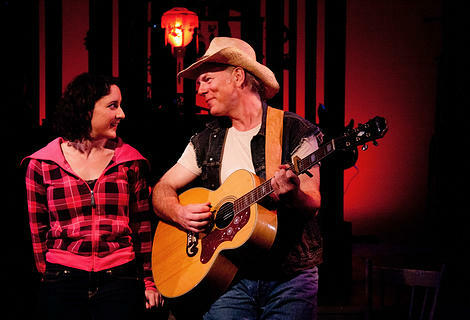 Photo by Terry Manzo, J.D.Nicholsen and Rebecca Auerbach play Johnny and Caroline.in the production of Dear Johnny Deere, which is currently playing at Blyth Festival Theatre. 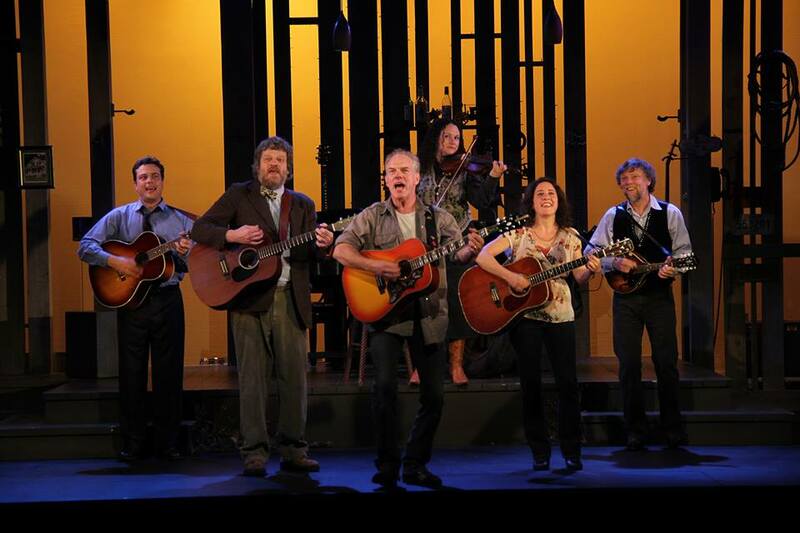 On Tuesday I was fortunate to attend the Blyth Festival Theatre and watch the first 2013 performance of Dear Johnny Deere. I was so happy to hear that Blyth Festival decided to bring back the show for a short run, as I was not able to make it in 2012. I had only heard and read good things and I really was blown away. 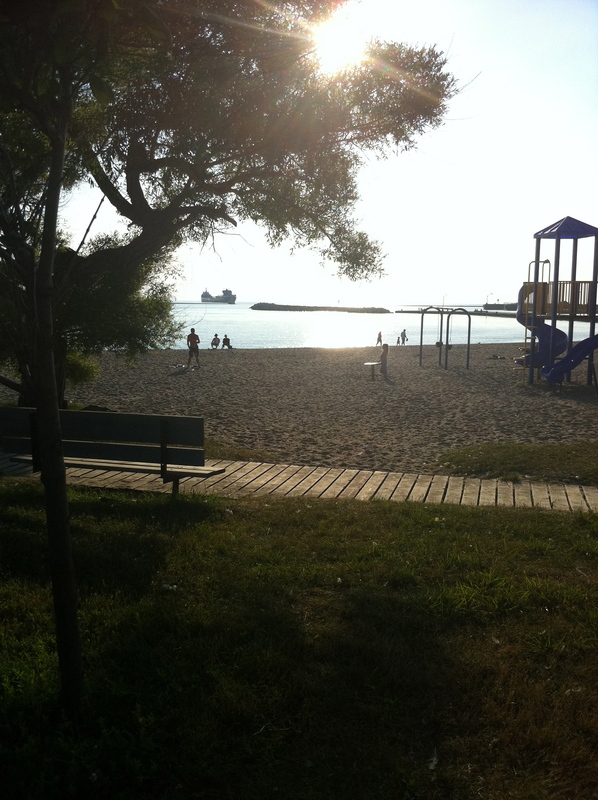 I said to a friend that it reminds me of growing up in Huron County! The show was written by Ken Cameron, directed by Eric Coates and based on the songs of Fred Eaglesmith. I hadn’t listened to Eaglesmith before, but have now downloaded a few of his tunes and I can’t seem to get the songs WhiteTrash and I’m Wilder Than Her out of my head! The set is simple with the main focus of a baby grand piano and musical instruments hung up all over the place. We were told at the beginning to “use our imagination”, right away I thought … I know some people who might have trouble with that… but after watching the show and seeing how the cast and set inspired imagination, it was no problem at all. So here is the update post about the concert at East Street Station on March 15! First off, what a great venue to relax and enjoy music, even when the venue is totally packed full. They hold regular coffeehouse events through out the year. 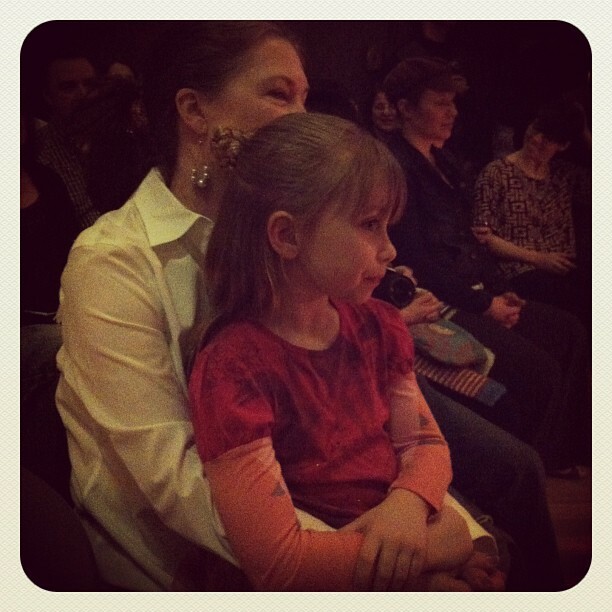 Brenda and Isabella Nurse of Rostock enjoy the show. So if you haven’t noticed I am a big fan of rural living in Canada. I am always so happy to hear people talking and singing about our great country! 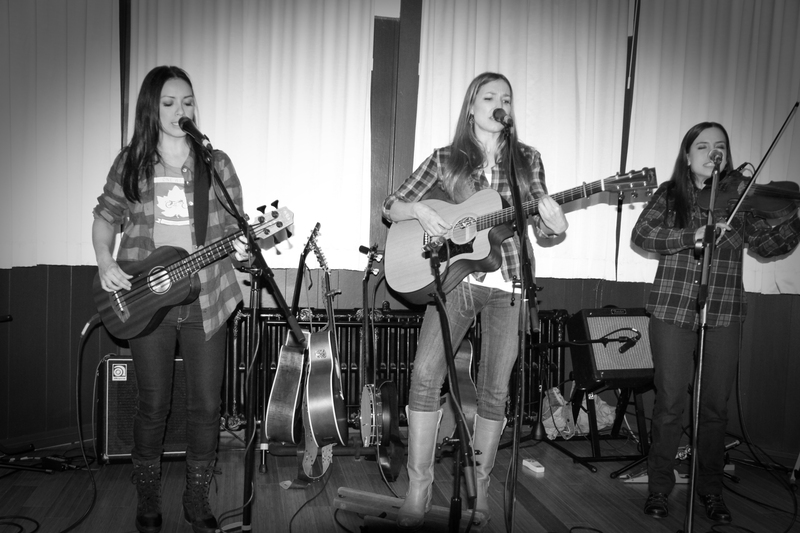 Trent Severn has created music with a story, they use the slogan “Folk From Canada”, singing songs with familiar names in their titles such as Mulroney Times, Truscott, Like a Donnelly and Bluenose Dime. Their sound is big, three part harmony with banjo, bass, guitar and fiddle, it makes my heart smile and brings me back to when I was a kid. My toe was tapping the whole time and I really felt that if there was a dance-floor it would have been packed. Take a watch and listen to the video below, if you couldn’t make it to the concert Trent Severn has two gigs at the Dakota in Toronto on March 19 and 20 or check out their website www.trentsevernband.ca to get a longer listen and find out when there are upcoming shows! 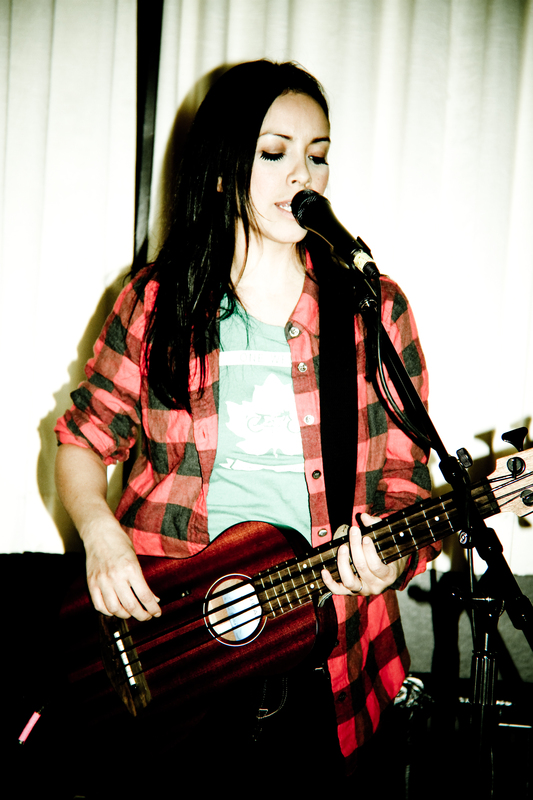 I have been lucky in the past to be able to perform on the stage of the East Street Station and with the likes of Emm Gryner. 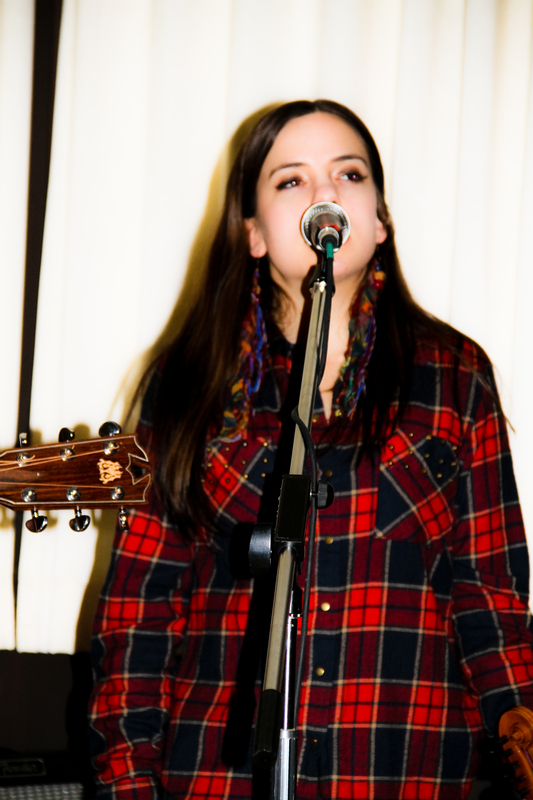 Ashley Anderson and I have done back up singing for her in the past and after forming Trent Severn she asked if Ashley and I would open a show for them. 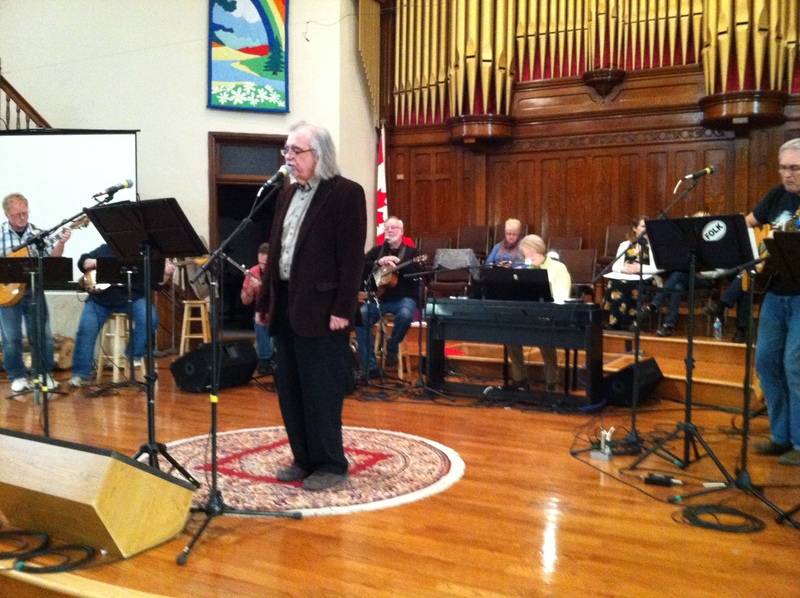 We were delighted, and asked Jamie Wallace, Bud Mabon and Brenden Purser to perform us. It was so much fun to share the stage with these three wonderful ladies. Here is a short video of one of the songs we preformed! I was at the East Street Station to watch the Trent Severn Concert and in the middle of their set Commander of the International Space Station, Chris Hadfield, called in to chat with us! How cool is that? Not only was this one of the most interesting phone calls I have ever been involved in, the whole concert was awesome. Trent Severn, made up of three amazing musician singer/songwriters Emm Gryner, Dayna Manning and Laura C. Bates, have come up with some really great songs and harmonies. 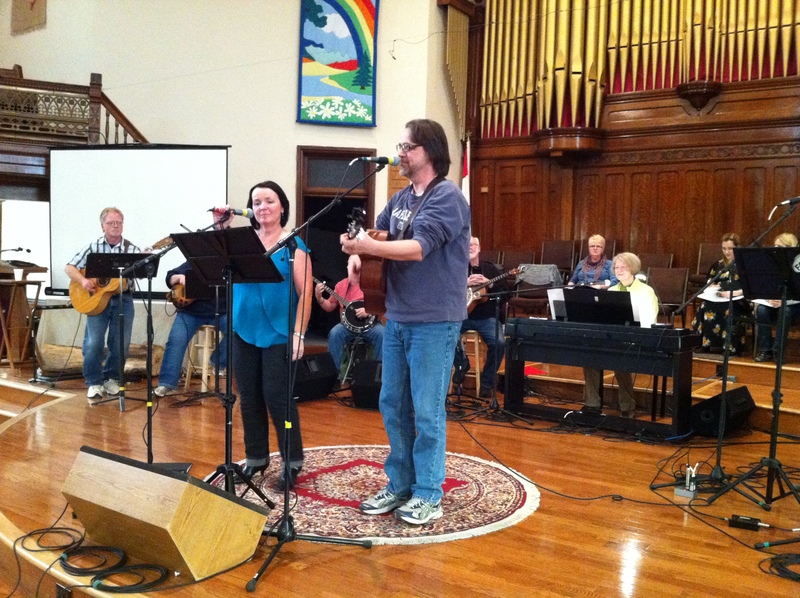 Their eclectic Canadian folk blend is well put together and they play from the soul. I am just editing the videos I took, so I will post them later! Hadfield told us that this was the first concert he had ever called in to from space. He also mentioned that it was 1:40am and that the sun was about to rise. He joked with the band that becoming commander has added to his to do list, have to make sure the lights were out and the garage door had to be put down! I took a video of the conversation with Chris Hadfield, but with 928 minutes left to upload it, I’ll post it later. My friend George Zoethout from Huron Image Factory posted the same video, but from a different angle, so here it is! Here are a few more photos of the event! 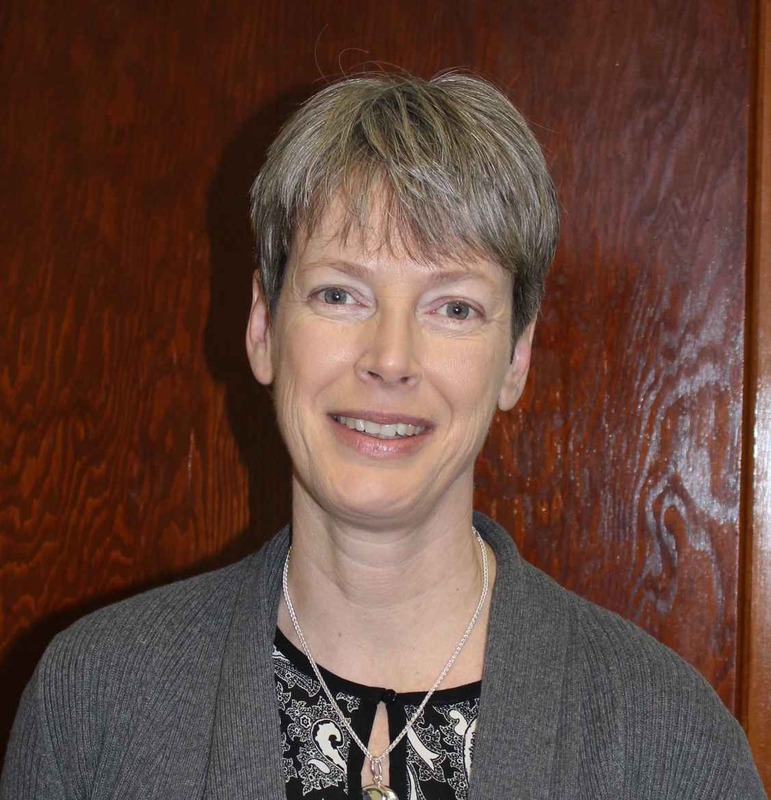 Last Saturday was the 4th Hootenanny, a fundraiser for the Goderich Celtic Folk Society. Organizer John Lodge, along with Warren and Eleanor Robinson, asked if I would be part of this event, to which I said yes! I hadn’t really heard of a hootenanny in the past, so I looked it up and found out that it is a sing along concert, typically in the folk music genre. There were a variety of songs performed throughout the evening including: Gordon Lightfoot, Joni Mitchell, Simon and Garfunkel and more. Well what a night I had. Not really knowing what to expect, this event truly blew my mind! 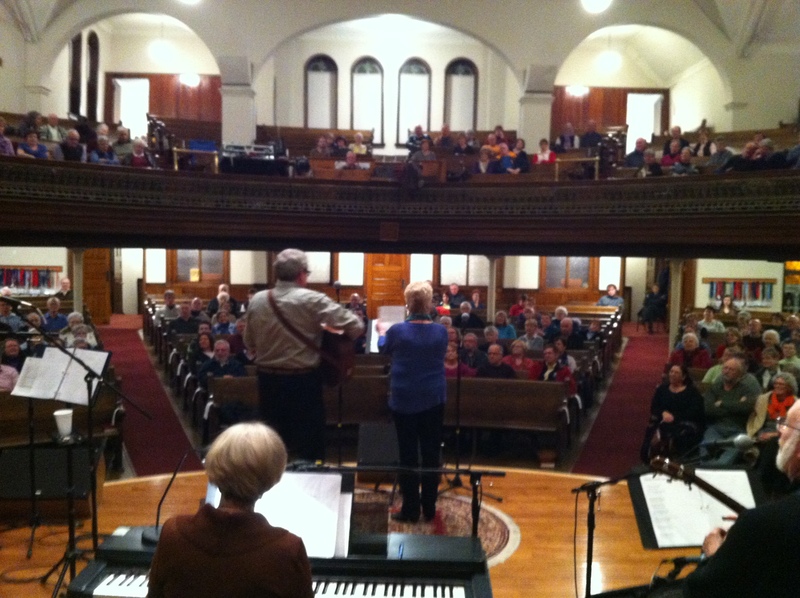 There were over 170 people in attendance and many people were singing along. There were 16 of us performing and each song was unique and different from the next. One thing I have to say is that I can’t wait until the next event! 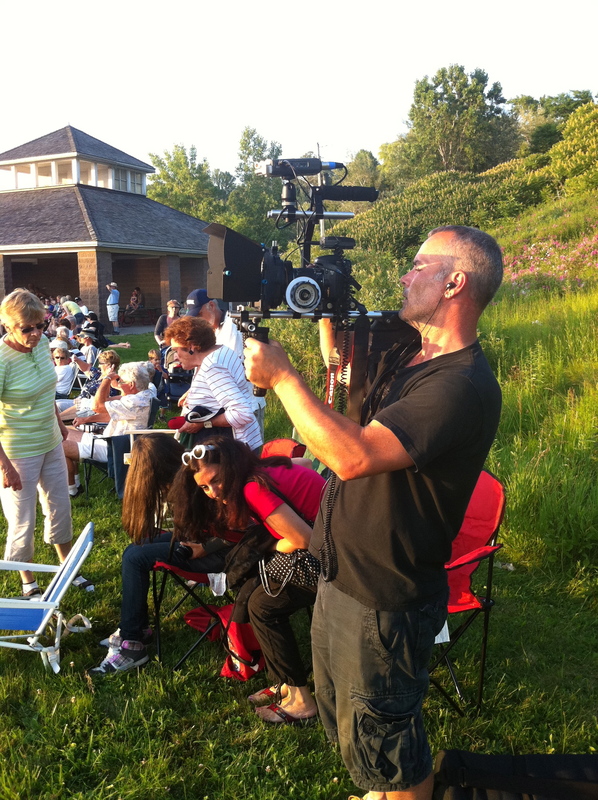 My co-worker and I have been trying to get video footage at as many events on Ontario’s West Coast as possible. We have been spending some evenings and weekends and have got to see some amazing things and try some very unique things! This past Friday was really great! 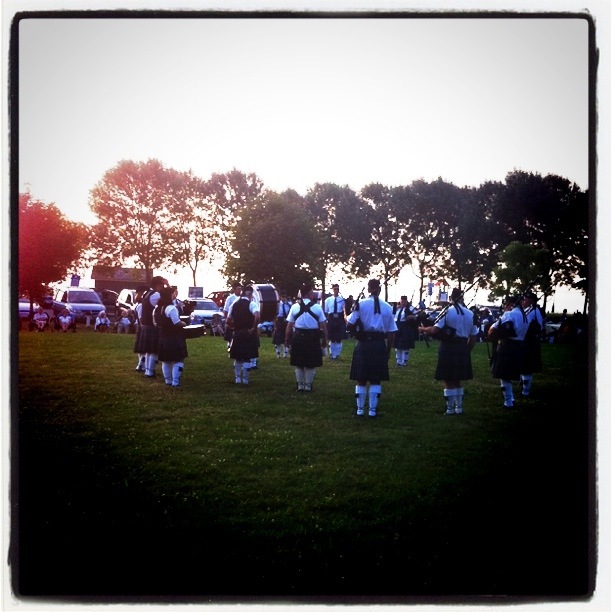 We headed to the Cove beach in Goderich and watched as the Celtic Blue Highlanders pipe band piped down the sun. I am not kidding you, there were hundreds of people at the event! 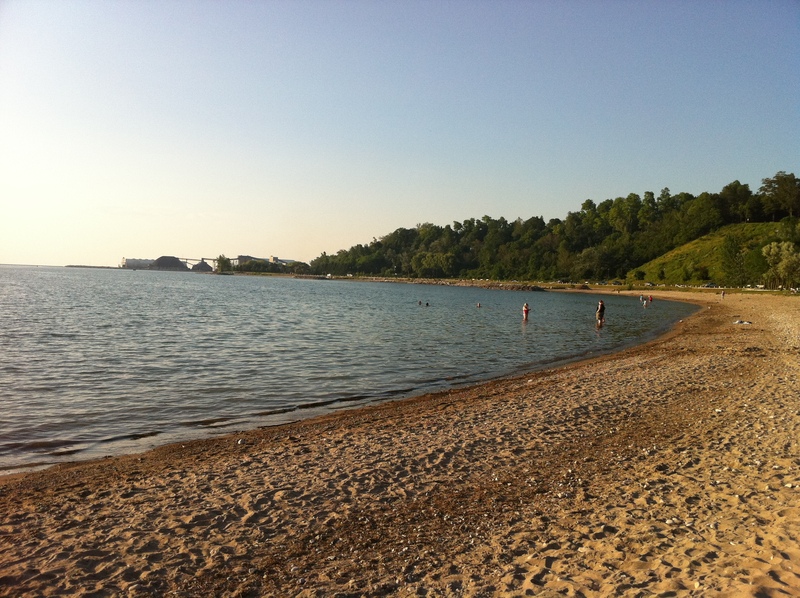 This phenomenon seems to be a Lake Huron thing and it happens every Friday in July and August. 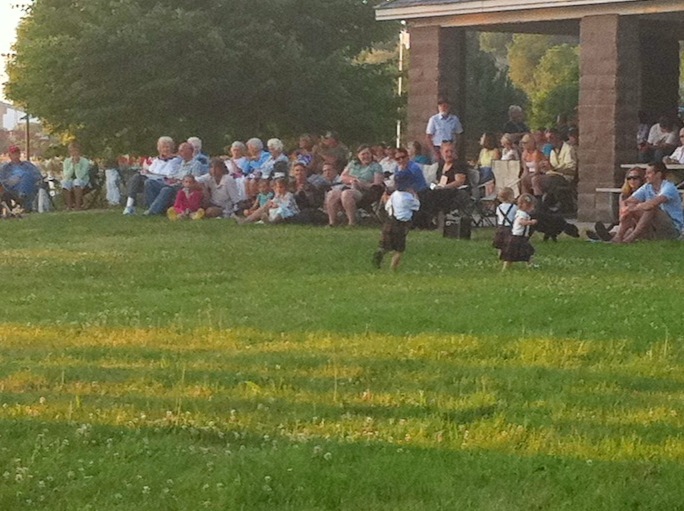 We watched families and friends gather all around the pipe band and listen to the music. Many of the children started dancing and running around the band, which was in a circular formation. People travel from all over Ontario, Canada and the world to watch this event, most of the people attending where from out of the area. 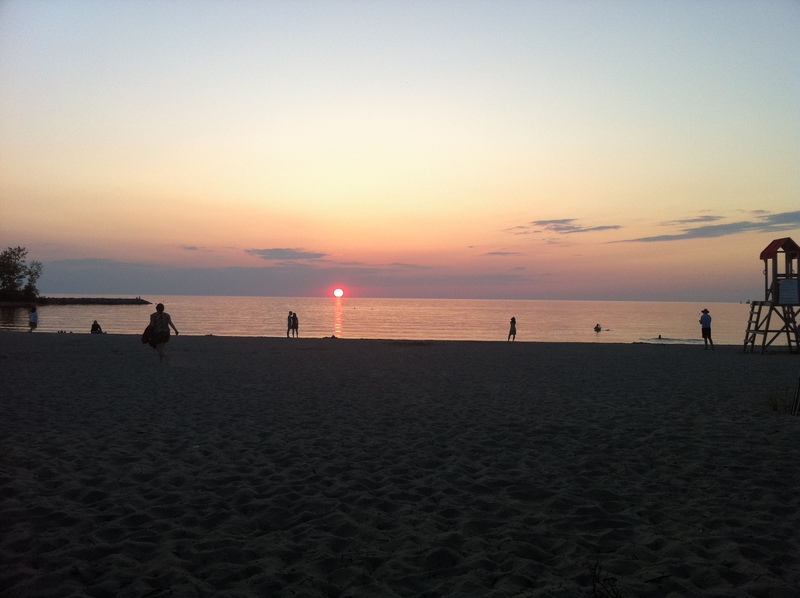 After we watched the pipe band for a while we headed over to the beach and watched the sunset, it was so warm outside that people where still swimming in the Lake. What a wonderful end to a Friday evening! Here is a video of one some of the happenings from the Friday night fun! Hey world, how is/was everyones weekend? Mine has been absolutely perfect thus far. Last night I went to the Bayfield town hall to see Juno award winner (best new artist) Meaghan Smith perform as part of the Bayfield concert series. She was absolutely incredible! Not only was her music amazing, but she was also hilarious. The show was very personal and intimate with less than 100 people. 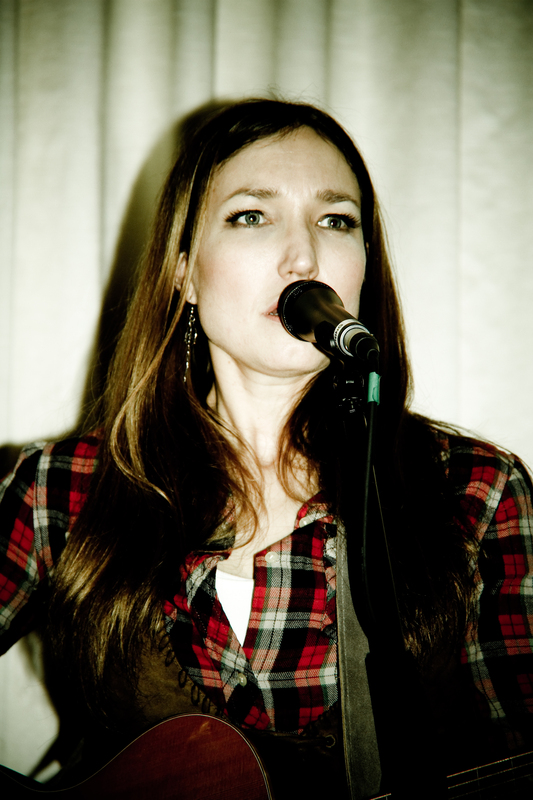 She shared a number of stories about the meaning of her songs, and growing up in Canada. This song is about an ex boyfriend of hers that was sent to jail… and then escaped. This story she says is 100% true, and provided the entire crowd with a laugh. Sorry if the video quality isnt perfect, I was using my iphone. Anyways enjoy!! Not only was she amazing to watch, but she was so sweet. After the show she stuck around to have a chance to talk to everyone and thank them for coming. She was such a friendly and lovely lady. Alright so I gotta tell ya, I have yet to be disappointed with a Bayfield concert series show, Peter Meades books such high quality acts every time. If you are into live music make sure you get tickets for the rest of his shows he has planned for the summer!